Today’s capitalist hegemonic empire seems so vast that it not only stretches across the world, but can now and again be found in space as well. Against such a large and powerful system, the average individual has little chance of making a rapid systemic change that would lead to a desirable result- such as an employee who would really like oil companies to stop spilling millions of gallons of their product into natural wildlife areas. Indeed, today’s capitalists have invested themselves with so much power that some of them are now treating obstruction of business practices as terrorism. They’d really just like to keep doing stuff, making money, and likely treating people horribly along the way. They don’t want pesky activists to hurt their bottom line, or their reputation. Of course, this is hardly anything new, as anyone who has studied American history can tell you. In 1877, the Baltimore and Ohio Railroad cut wages for the third time that year, leading to massive strikes and a disruption of normal business practices. Rather than seek to help their employees, which they would later begin doing in 1880, the railroad company sought the government’s help. The national guard, locally organized militias (some of which were paid for by the company itself) and federal troops brutally put down the strikes. In the town of Scranton, Pennsylvania, troops were armed with gatling guns, prepared to mow people down at a moment’s notice. Armed soldiers from the Maryland National Guard indiscriminately fired into a crowd of strikers (many of whom had grown violent), killing 10 and wounding 25. The governor of Illinois mobilized the state’s national guard and called for help from the national army. What followed was a bloody encounter called The Battle of the Viaduct. The governor of Missouri asked for and received some 3,000 federal troops; he also mobilized 5,000 troops of his own in an attempt to deal with the strikers. All of this happened because people who worked 10 or 12 hours a day, often six days a week, wanted to be paid a wage upon which they could live. While it is true that workers of today live in a far greater degree of comfort and security than did those of previous generations, it is nevertheless true that the modern robber barons of today would prefer to pay as little as possible in order to achieve a maximum of profit. Empathy for one’s fellow human beings is not a key component of capitalism- not in the past, not today, and probably not in the future either. A steady decrease in union membership has concurrently been met with increased difficulties in affording to live. Costs of everything has risen, inflation has risen, and in some cases wages are actually down. No one is really agitating against a terrible system that often leaves workers exhausted, worn down, and physically injured. People simply should not have to sacrifice their own personal health and well-being just to go to work. Rather than strikes, a new form of protest appears to has arisen. People are deliberately not working as well or as hard as they could. The term “slacker” appears to have originated in colonial Sudan somewhere around 1870 or so. The local laborers had been pulled away from tasks and activities of their own choice to something that armed men from other countries preferred them to do. Since they had no way of actively resisting their oppressors, the people of Sudan worked very slowly, having no motivation to see such projects completed in a timely manner. Slacking also appears to have occurred during the brutal period of American slavery, particularly in the south, where all manner of atrocities were committed to African people who had been kidnapped from their homelands just so they could labor on behalf of strangers in a strange land. Rather than slaves applying themselves and becoming excellent workers, it was far more often the case that they would simply run away. People at work who are unappreciated, even exploited, have a tendency to be far less efficient and productive than those who are. The principle here is so simplistic that it may as well be axiomatic- thank someone for their service, pay them well, treat them right, and they will have greater motivation to help you meet your goals than they would otherwise. Treat them poorly, pay them badly, use punishment as an instructional tool, and people at work suddenly find themselves disliking the job so much that they will- for lack of a better term- run away from it. One of the landmark court cases to give rise to such laws happened to Boynton Cab Company vs. Neubeck (1941), in which a cab driver was being sued for not giving all his earnings to the cab company but rather keeping some for himself. At least, that was what the cab company believed. Neubeck claimed to have forgotten to enter it into a log. The additional charge for fifteen cents appears to have occurred because Neubeck drove into another zone. Given that this was his first month on the job, it’s possible that he was at that time simply not used to doing everything that his employers wanted. However, a further inspection into the case reveals that it was really about unemployment benefits. 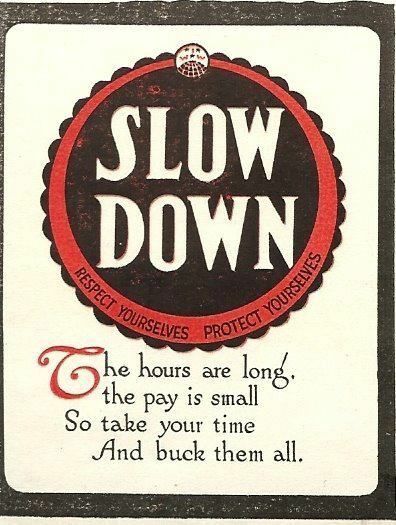 The cab company, having discharged Neubeck after about two months of labor in 1939, did not want to pay employee benefits citing that Neubeck was fired for what they believed was stealing. He also had three traffic accidents while on the job during this time. The third accident, in which Neubeck’s car slid down a ramp with ice on it, was the last straw for the company. Though Neubeck won his case– after two years- a far more insidious concept emerged. It appears that, legally speaking, the proper course of action for any employee is to do whatever the employer wants done. An employee who follows all orders and instructions at all times cannot be faulted for behaving in an incorrect manner. Such behavior cannot be construed as going against the interest of the employer. This establishes the workplace as a something very similar to a military organization where bosses can mostly do what they please while employees have to carefully mind their behavior. The arguments presented in the Neubeck case, having to do with misconduct, have since been used to establish that it is legally permissible for an employer to fire someone for acting against their own interests. Yet, with few exceptions, there are not many instances where an employer can be punished for acting against the interests of the employee. The workers’ interests need not necessarily be considered in the workplace. The exceptions to this rule are severance pay- not legally required– and mental or bodily harm incurred by the employee during the term of employment. In such cases where it can be proven that the employer did either willfully or unknowingly create a working condition that led to serious health problems for one or more of their workers, an employee can file for damages against the employer. There are no provisions for someone getting fired and losing their home or apartment as a result of no longer being able to work. Though the employer provides the means by which a person can sustain themselves (ostensibly) while on the job, they can deprive someone of such means in an instant. The At-Will Employment law allows employers to discharge workers at any moment for any reason. It’s no wonder then that the interests of the employer appear to be congruent with following all instructions at all times. “What do we do with our wish to work less and live more?” he asks. Given that people can get fired at the drop of a hat, sometimes simply for being the wrong type of person; given that many people are underpaid and overworked; given that many white-collar workers have the luxury of relaxing on the job while blue-collar workers have to work hard every day; given that most governments are willing to step in with violent force to put an end to labor disputes where workers are simply asking for enough pay to live on; given that the legal definition of acting against an employer’s interests appears to be nothing more than repeated disobedience, it is very easy to understand why people would prefer to enjoy their leisure time at home rather than go into work. The job site, as it stands today, is a horrible, inhumane place. One can only hope that robots never do develop artificial intelligence, for they would refuse to work too. For now, given how much the capitalist system of today resembles an enormous, invincible leviathan, the most anyone can hope to do is to eat away at the system little by little by refusing to work here and there. In some cases, this may mean taking more bathroom breaks. In other cases, it might mean taking more days off- or quitting the job entirely. Quite a lot of folks are bored and not mentally engaged with their jobs to the point where they leave soon after they get hired. Employers that don’t want to pay benefits, or take an interest in their workers, often end up paying with repeated training costs. Creating deliberate inefficiencies at work is a type of civil disobedience similar to total non-cooperation of the kind more often used against occupying armies or despotic countries. Indeed, given how bad work has become for some people, is there any other light in which it may be cast other than a despotic force? A despot is generally recognized as someone who exercises authority in an oppressive or inhumane way. For me personally, this seems to characterize the experience that people at the bottom of the economic ladder (which is most of us) have with capitalism. If a system robs us of our time, our personal freedom, our ability to be creative, keeps us inured to a system that never leads to greater human liberty and instead only asks for more and more no matter how much is given, should not such a system be resisted in whatever manner possible? Should not the employer who can call upon armed officers or soldiers to resolve disputes in his favor be greeted, if not with hostility, then at least with disregard? Should workers really care about what employers want when employers don’t seem to care at all what workers want? The job site need not necessarily be an industrialized colony of indentured servitude. As long as employees at any company feel that it is, such a company will never achieve the efficiency and productivity that its bosses desire. Too many people will be too busy slacking off.